During the latter part of the 19th Century there began a rustling in the tops of the mulberry trees; the gentle winds of Aliyah began stirring. Man and nature knew that something momentous was about to happen. The long, dark chapter of Jewish exile was about to end as G-d looked down on his people and said, “It is time.” During the two thousand years of persecution and horror in the nations where they’d been scattered, the House of Israel had been reduced to a valley of dry bones. Now the Spirit of G-d was hovering over the valley as it had hovered over the waters of Creation. The Spirit of G-d filled them, and they stood upon their feet, a great army. What began as a trickle soon became a stream as Jews heard and responded to the shofar call to return to Zion. 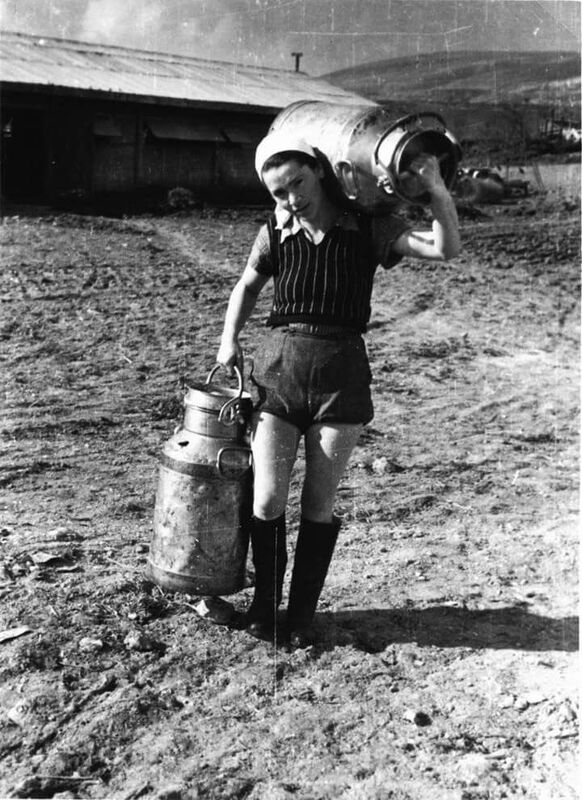 Only two years after Independence, every third person who walked the streets of the newborn State had returned after May 14, 1948. They came – the young and the old; the strong and the sick; pregnant women, and children nearly blinded by trachoma. Together with the traumatized masses who had survived the ravages of the Shoah and displaced persons’ camps of Europe, came Jews from the ghetto gutters of North Africa who had been uprooted from the ancient Jewish communities of the Maghreb. Some came on foot across the blistering sands of the Yemen and Arabian deserts; others came on the ‘wings of eagles’ like Operation Magic Carpet that carried some 50,000 Yemenite Jews to Eretz Israel. 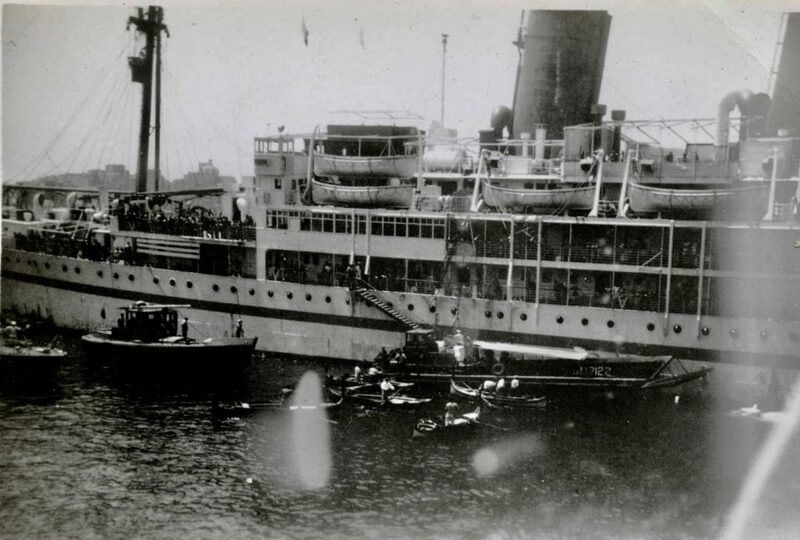 Still others others came in rusty, barely seaworthy vessels, carrying their ‘illegal’ human cargo to the shores of Zion under the threat of the British blockade. Had there ever been such a stream of people returning to their ancient homeland in so short a time? One of these new olim was a young boy, not yet fourteen, named Yoseph from Fes, Morocco. He found himself, one day, standing on the platform of the train station; one of a crowd of bewildered children bidding farewell to not only his family, but also his past. Another Abram. Amid the jostling and commotion and tearful goodbyes, Yoseph’s Savta pressed a sandwich and a tiny wrapped parcel into his hands. The train whistle blew, the locomotive billowed clouds of smoke as it pulled out of the station, and Yoseph found himself, too abruptly, a boy alone. Close to tears, and with no appetite, he unfurled the wrapping of Savta’s love-gift. He saw a beautiful silver fork, knife and spoon set that , in the years to come, would always remind him of his childhood home in Fes. Many years later, that young boy was to become my husband, and that little cutlery set my treasure. The steam locomotive chugged along with its precious human cargo, heading for the port of Casablanca where the bewildered children would be met by a Jewish Agency emissary from the Aliyat Hanoar Department( Youth Aliyah) who would accompany them on a ship headed for Marseilles, France. When the ship docked in Marseilles, they would be accompanied to temporary transit locations; ‘collection points’, so to speak, while they awaited the arrival of the ship that would carry them to their final destination, Eretz Yisrael. The children soon made friends, knit together by the trauma and excitement of their journey; friendships that would last a lifetime. Yoseph’s sojourn in France was spent at an orphanage in Montpelier. One fine day a rather rickety ship, the ‘Negba,’ docked in Marseilles and the dream became a reality. The family of children set sail for Naples, Italy and then for Piraeus, Cyprus where other children joined their ranks on the holy adventure. The ‘Negba’ was now carrying three hundred and three children from the lands of Egypt, Morocco, Tunisia, France, Brazil, Algeria, America and Holland to their beckoning ancient land, now pregnant with future promise. 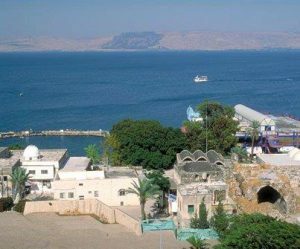 On the 8th April,1952, a beautiful spring day, the Negba approached the harbor of Haifa, a stone-stepped city huddling against the biblical Mount Carmel. For Yoseph it was love at first sight; and the realization of G-d’s promise to His people: “Rise up my love, and come away…the winter is past…the flowers appear on the earth…the time of the singing of birds is come…the fig tree putteth forth her green figs, and the vines with the tender grape give their fragrance.” (Song of Songs 2:10-13) After completing the required customs and quarantine inspections, Yoseph and his companions spent their first night in the Promised Land in an immigrant house high on Mount Carmel. The following day the youths were met by emissaries representing the new farming communities in Israel, called kibbutzim, who then accompanied each respective group to a ma’abarah or transit camp. 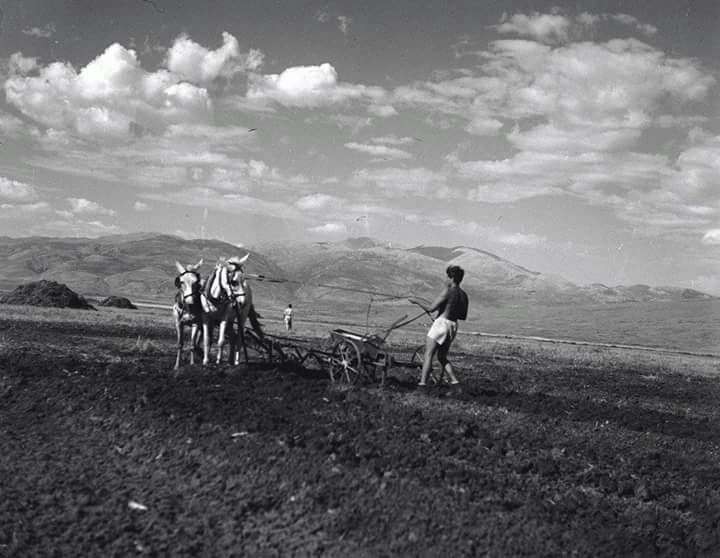 Yoseph’s group was selected to go to Kfar Giladi, a kibbutz high up in the north of Israel overlooking the Hula Valley, which straddled the Lebanese border. On their arrival they were greeted with songs and spartan wooden tables bursting with the crops of the Land; a mini-wedding between the Land and her returnees. They were like dreamers, their mouths filled with laughter and their tongues with songs of joy. 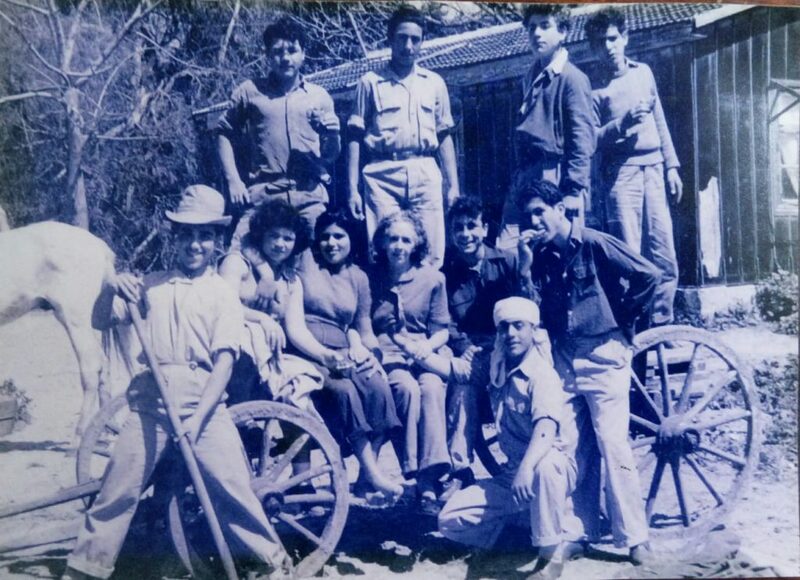 ~ At Kfar Giladi – Yossi on the left wearing a hat. They soon learned, however, that this newfound freedom did not come without price. These northern settlements faced constant attacks by Arab marauders and armed gangs who stole their produce and set their fields on fire. They learned that for the Jew in Israel, land meant life and no land meant death; and that Israel was a Jewish island in the midst of a hostile Arab sea. 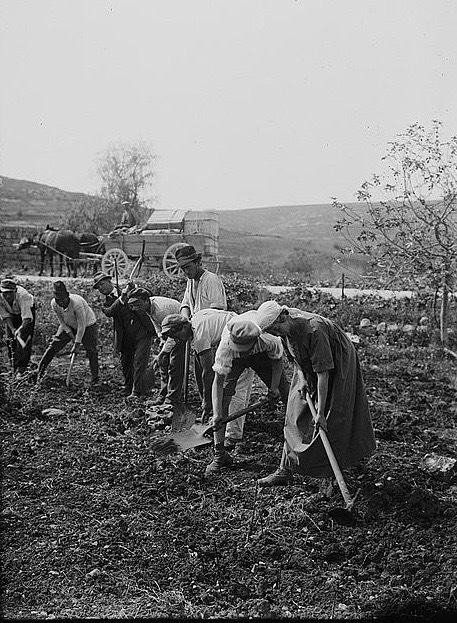 The kibbutz transformed its new halutzim (pioneers) into a new type of man: tillers of the soil in peace and fighters in war. 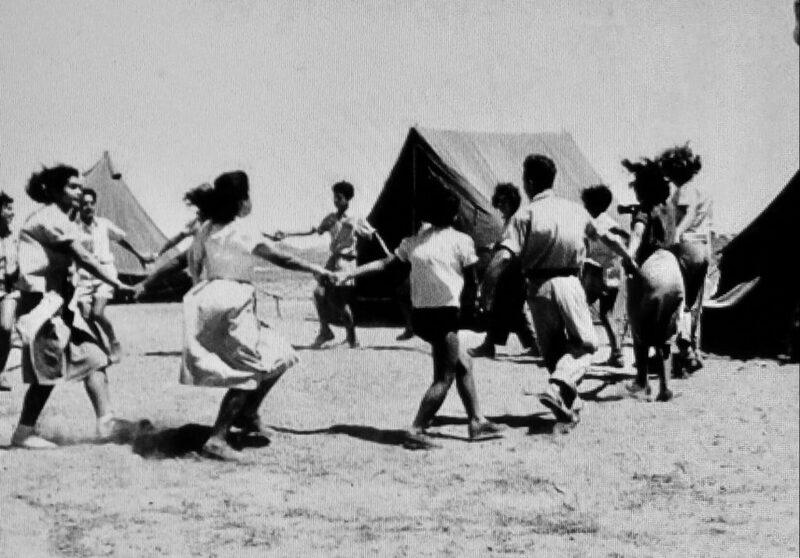 The dream and aims of the kibbutz movement were to reclaim the Land, restore it to its previous fertility and, also, to restore to the Jewish people its national life, language and culture. Its principles of freedom and equality united all of Israel into one big family. Members ate their meals together in the communal dining room; their children slept together in childrens’ houses. By day Yoseph and his friends joined the seasoned kibbutzniks and toiled the fields, drained the malarial marshes and lifted boulders with their bare hands. In the evenings they would gather for lectures and poetry recitations, or join in the communal singing and dancing of the hora beneath the stars. Hebrew, the Language of the Book, used in the Diaspora only for studying the Sacred Scriptures, now became the daily language of the People of the Book. The tongue of Solomon’s love songs and Moses’ Torah became the language of the new State – of bus drivers and street sweepers and statesmen. It was the language now used to buy bread and sugar and shoes. 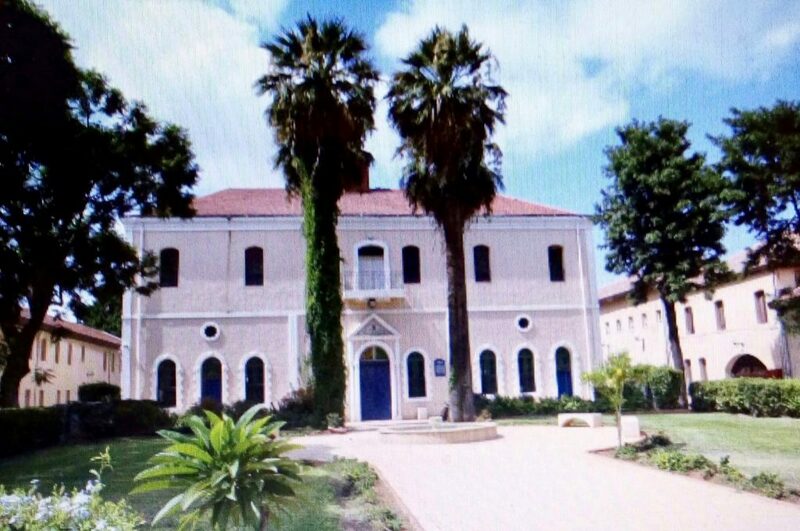 After a suitable period of adjustment, Yoseph, now affectionately called Yossi, and his fellows were sent to the Mikveh Yisrael agricultural institution in Holon, near Tel Aviv, where young Jewish olim were schooled in all fields of Zionist activity, agriculture, and defence. Founded in 1870, its name was taken from two passages in Jeremiah, 14:8 and 17:13. The goal of Mikveh Yisrael was to equip these young boys and girls to establish villages and settlements all over Israel and to help the desert to blossom as a rose. 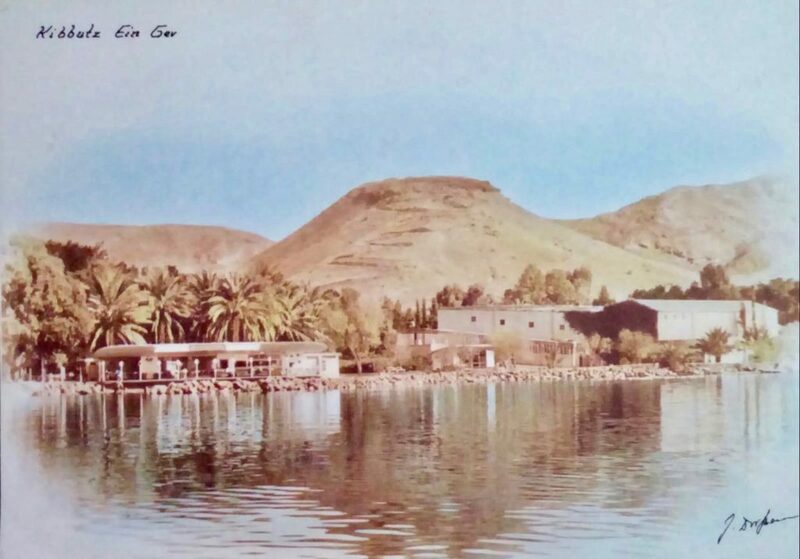 From Mikveh Yisrael Yossi was absorbed into his new permanent home, Kibbutz Ein-Gev on the yonder shore of Lake Kinneret. Located at the foot of ancient Susita, and nestling in the shadow of the towering Golan Heights, Kibbutz Ein- Gev came under constant Syrian bombardment. Yossi was ‘adopted’ into a kibbutz family and it was not long after that he, together with other boys in his kvutza, became Bar Mitzva. These were the days of tsenna (austerity) when strict rationing was a way of life and all that each young man was given as a Bar Mitzvah gift were a lollipop and a Sefer Torah. These young pioneers were idealistic men and women of the soil and cared not for material things; even the clothes they wore were shared. They owned nothing, yet lacked nothing. How good and pleasant it was back then when brethren dwelt together in unity. When Yossi wasn’t toiling in the banana and date plantations or milking cows in the reffet, he was baking bread and braided challot for Shabbat in the communal kitchen. 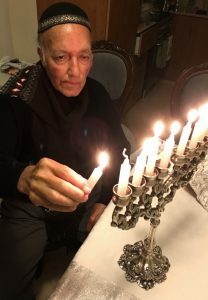 He remembers the singing of the songs of Zion around the bonfires of an evening and the long hours of keeping guard under possible sniper fire in the dead of night. 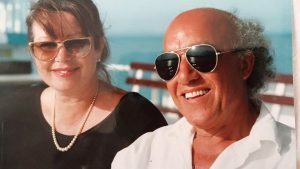 He also remembers the endless wars; losing his friends; captaining the boat that would carry wounded IDF soldiers from the Golan across the Kinneret to the hospital in Tiberias. 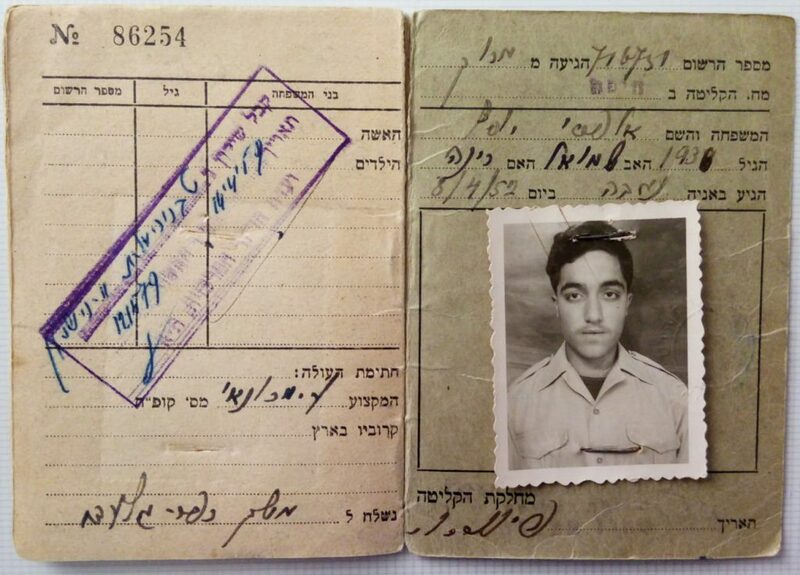 He remembers his long conversations with David Ben Gurion, Moshe Dayan, Yigal Allon. The honey and the thorn; the bitter and the sweet. But most of all he remembers celebrating Chaim – Life. Bar Mitzva – literally ‘a son of the commandment.’ When a Jewish boy turns 13 a ceremony is held in celebration of his “taking on the yoke of the Torah.” He comes of age to take responsibility for continued study and obedience to G-d’s Word. This is so beautifully written. Thank you so much. I want to learn, learn, learn ! I am not Jewish, but God has put such a love in my heart for all things Israeli. Thank you again. Hi Debra, thank you for sharing this wonderful story of Yossi’s journey. I felt such richness as I read this, also a sadness as it must have been hard for him leaving his family at a young age, his Savta giving him food and what a treasure that cutlery set is….found this quite moving! There is no doubt that character is built out of hardship. What I love about the Jewish way of life is “Chaim” – to lift up life even in struggling circumstances…..this comes through in your story of Yossi. Amen,Wendy, and thank you for your comment. May it be so! Baruch Hashem. Inspiring and full of חזון.